Often considered commercial products, or private purchase knives. The question is, are they all post-war or were some of them issued during the war? 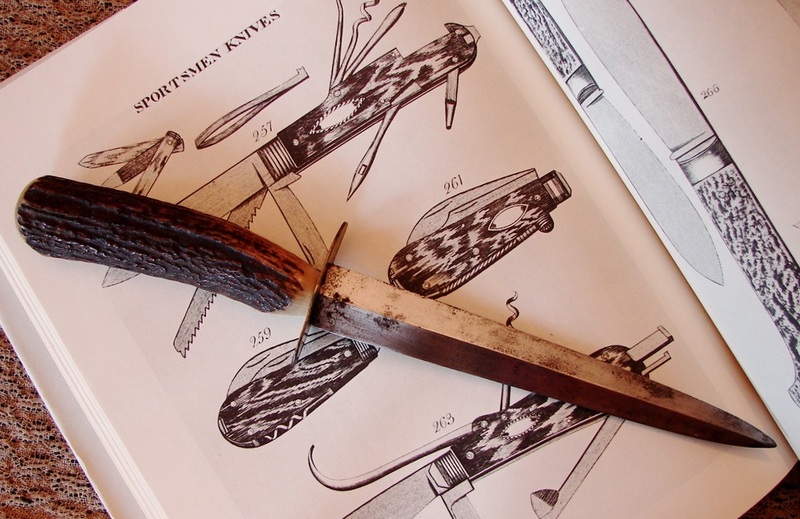 We have learned that these knives were often sold by Men's (and especially Military) bespoke tailors. 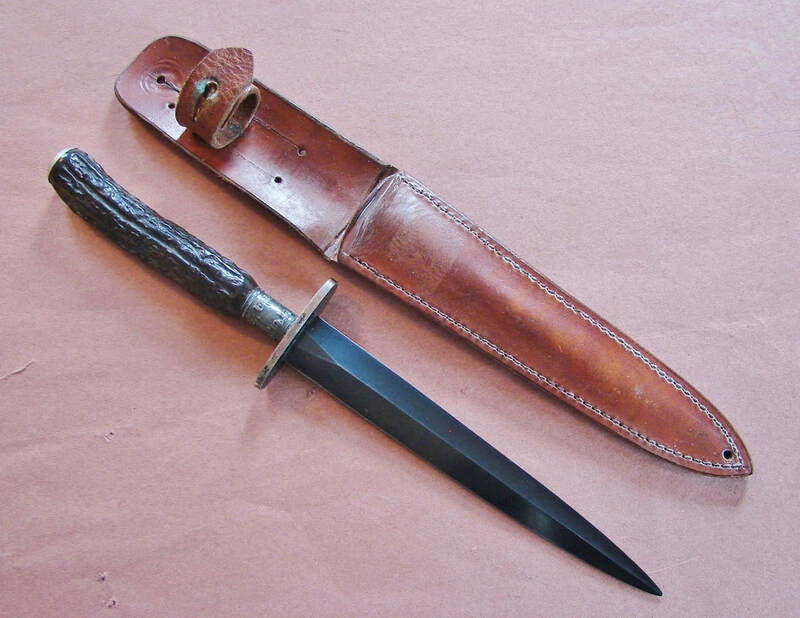 Below: This is a knife with WW-II heavy blade and guard. The handle is nicely adapted from a Table Cutlery knife or at least is of that style. The handle is faux antler and has nickel silver mounts.The heavy leather sheath is very well made and, despite having belt slots, looks as though it was suspended from a button ala Camp-x style. This was another gift from my friend in California. His generosity has been beyond belief. 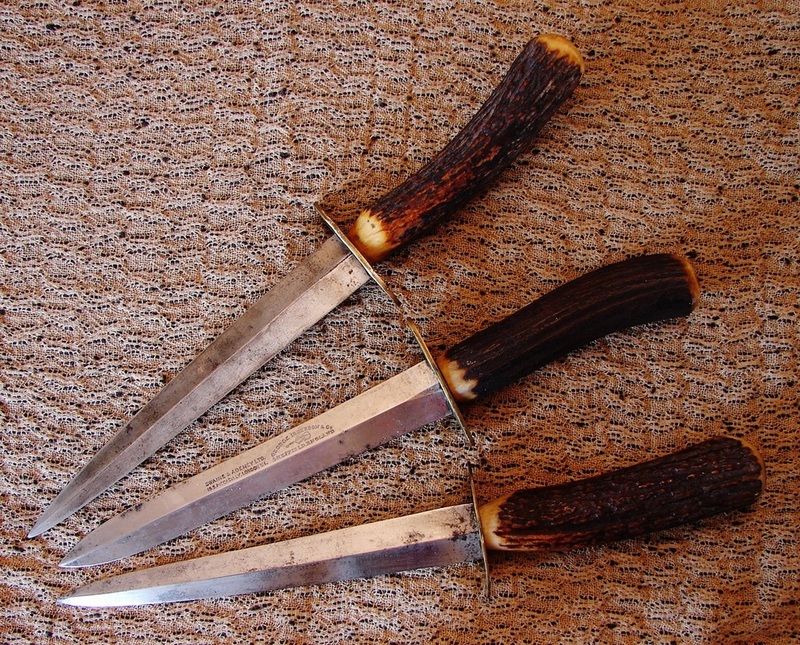 This is one more example of the unending diversity in World War II Fairbairn-Sykes knives. There are three more knives that were donated at the same time and they are all different. Below: The lower knife is not a WW-II era knife as far as i can tell. It has all of the attributes of a First Pattern except for lacking the rapid taper. This knife's blade tapers more gently. I have shown it next to a genuine WW-II first pattern knife for comparison. I cannot determine what was removed from the ricasso by grinding, but there are shadows of some sort of etching on both sides. They are suspiciously the same size as the Wilkinson ones. But why would anyone remove them? 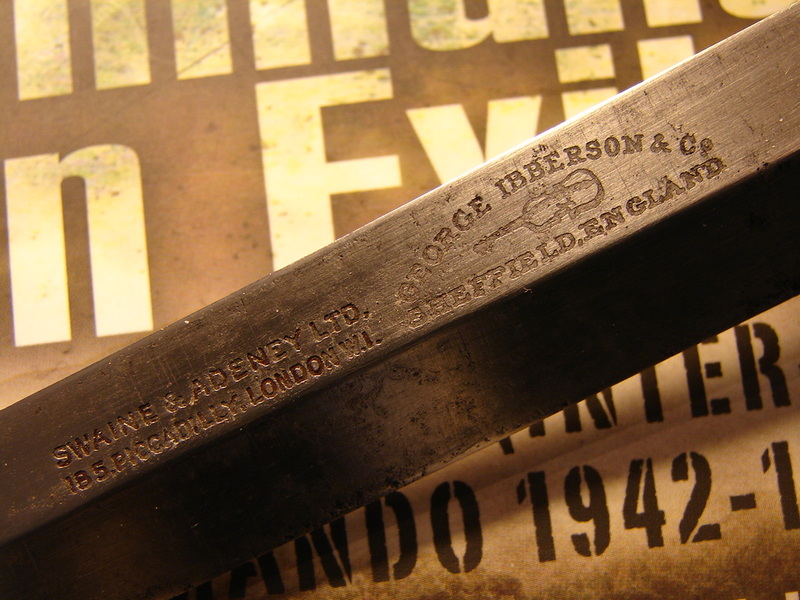 The Center knife was made by George Ibberson & Co. Sheffield, England and is also marked for Swain and Adeney Ltd., Picadilly London. The other two knives are completely unmarked. The Ibberson blade has a completely different profile, shaped almost like a Gerber MK-II. The knife on the right has a very thin brass guard. None of these knives came with their original sheaths. 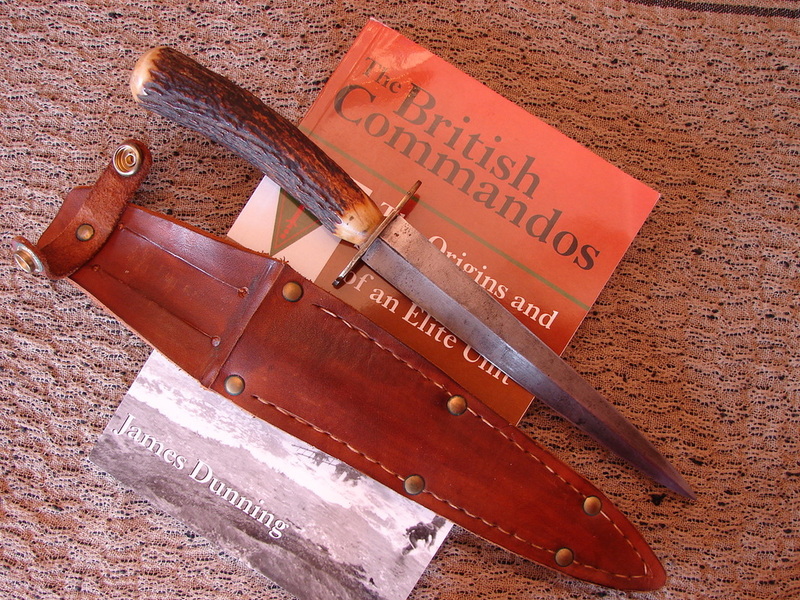 Most examples I have seen were fitted with the flimsy commercial hunting style sheath. 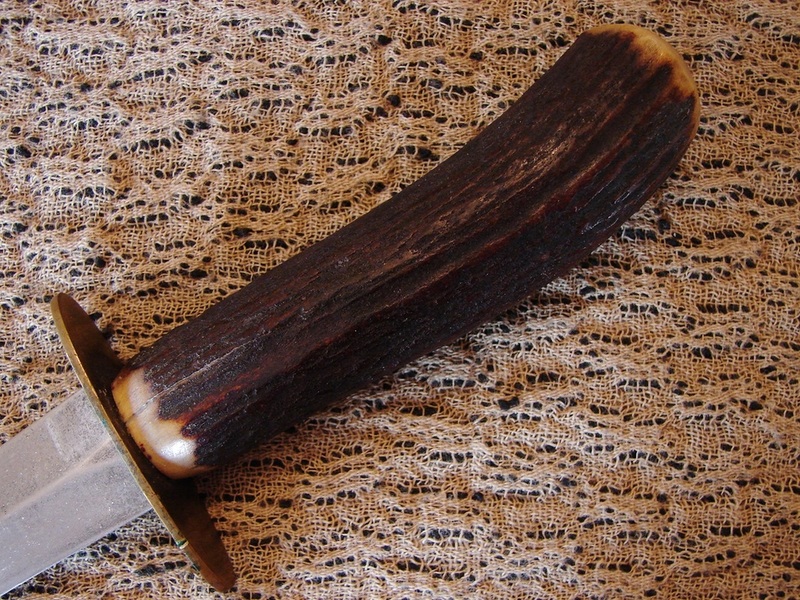 Unlike the Cutlery hilted knives, the stag handled ones actually use a full tang. 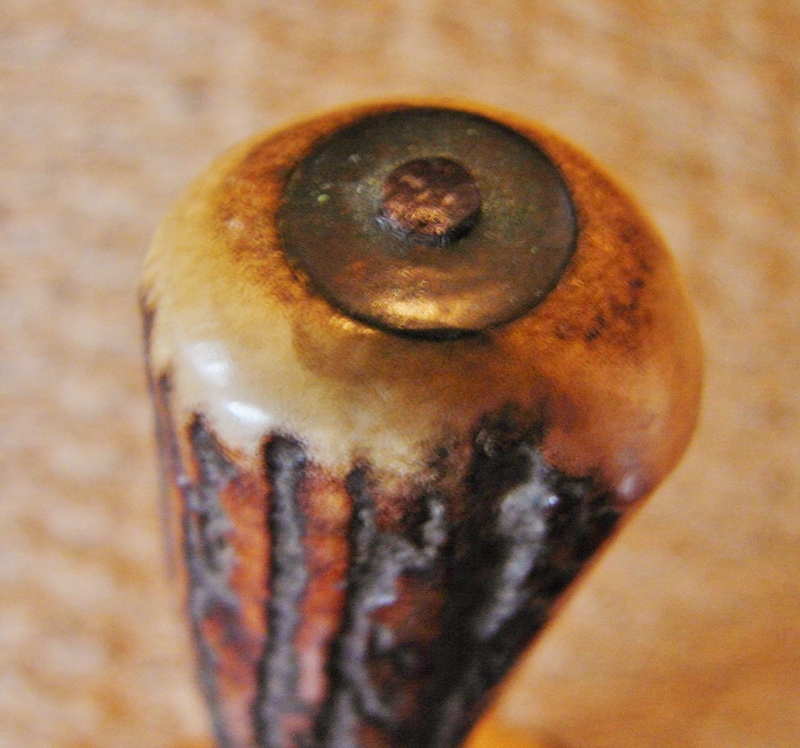 The end of the tang protrudes through the stag, is capped with a metal washer and peened over. Despite this attention to detail, shrinkage of the stag antler causes cracks, splitting, and eventually looseness in the guards. This is a fact of life when using natural materials which are affected by age and changes in humidity. All of the blades are polished better than usual even though they are still the third pattern weight blades. Thin brass guards are the type most commonly found. The natural curvature and texture of the stag makes for a warm and comfortable grip. 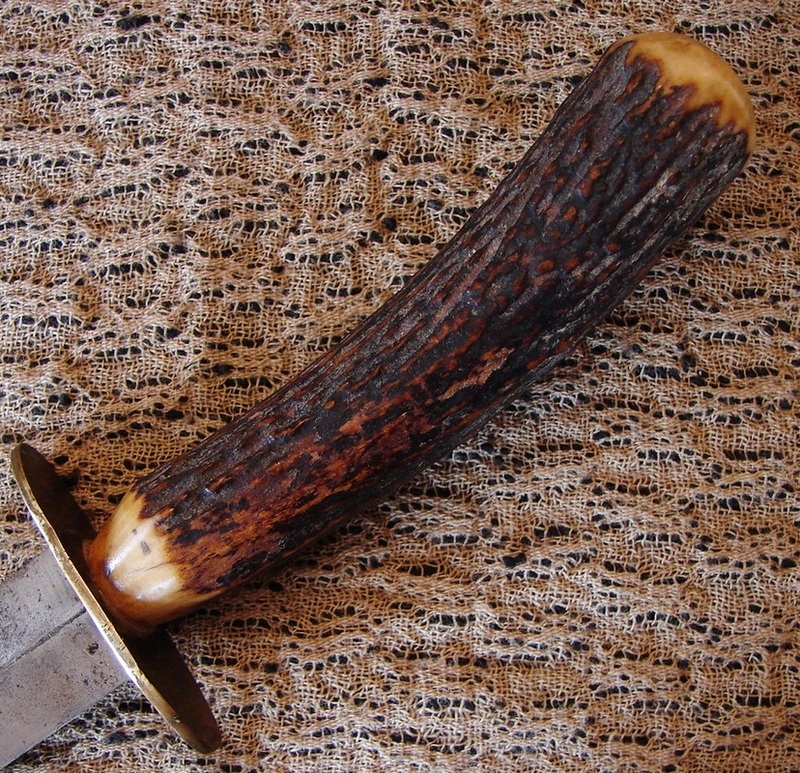 Below: This is a good example of a stag hilted knife. The sheath is not original. I made the sheath for another knife years ago. 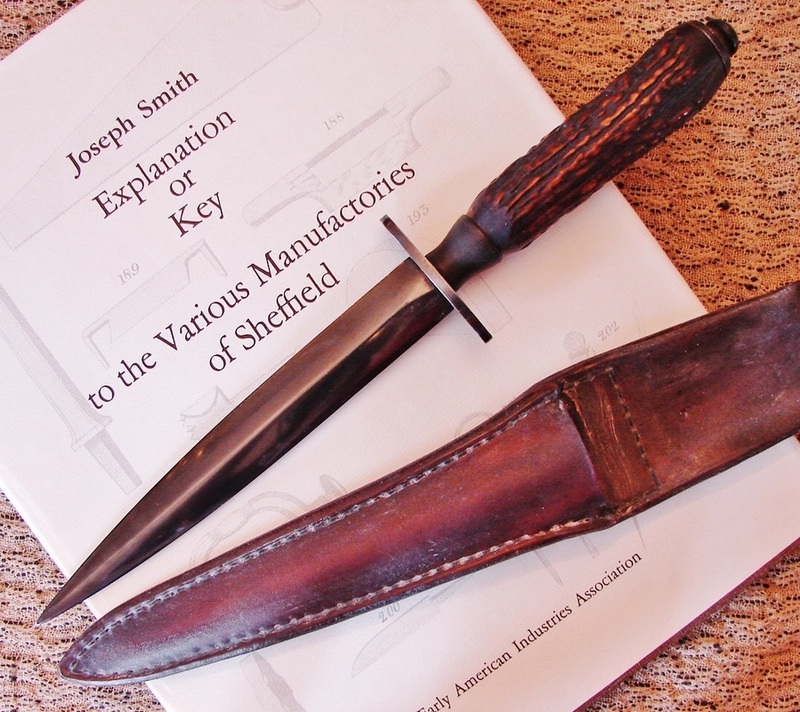 Below: Is it probable that this knife, and the other two shown above, were made in Sheffield, England since it was and still is a cutlery center. Below: This knife is truly in a league of its own. The quality of the stag grip, the finely shaped and polished guard, all suggest a highly skilled craftsman. The handle is capped at both ends with a blued steel pommel and ferrule. I have never before seen this fine an example of a stag handled knife. The sheath is also custom made and of the highest grade leather and quality construction. The heavy blued blade may be from a second pattern knife and the bluing is in excellent condition. I have no provenance to establish when this knife was converted or if it was just a custom order. It is possible this is an India-made knife.